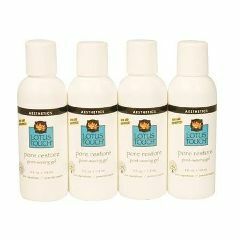 Lotus Touch Pore Restore, 4oz Buy 2 Get 2 Free! Water (Aqua), Hamamelis Virginiana (Witch Hazel) Distillate, Glycerin, Xanthan Gum, Lavandula Angustifolia (Lavender) Oil, Salix Alba (White Willow) Bark Extract, Lavandula Angustifolia (Lavender) Flower Extract, Chamomilla Recutita (Matricaria) Flower Extract, Aloe Barbadensis (Aloe Vera) Leaf Extract, Tocopheryl Acetate (Vitamin E), Phenoxyethanol, Chlorphenesin, Fragrance, Polysorbate 20. Lotus Touch Pore Restore 4 oz Buy 2 Get 2 FREE! Ideal for post waxing services. Pore Restore is alcohol free so there is no burning sensation after it is applied. Natural witch hazel and moisturizing aloe soothe irritated skin and help reduce the appearance of waxing irritation and razor bumps or PFB. Light, unisex fragrance makes this perfect for men or women. Available in 4 oz squeeze bottle or 32 oz pump. Your company earned some kudos yesterday. You had told us delivery was 3-6 days and got the needed supplies to us in about 30 hours. My wife was very pleased with the quality of the merchandise purchased. It is always a little scary purchasing products on line, but your product met or exceeded the expectations raised by your on-line catalog descriptions.